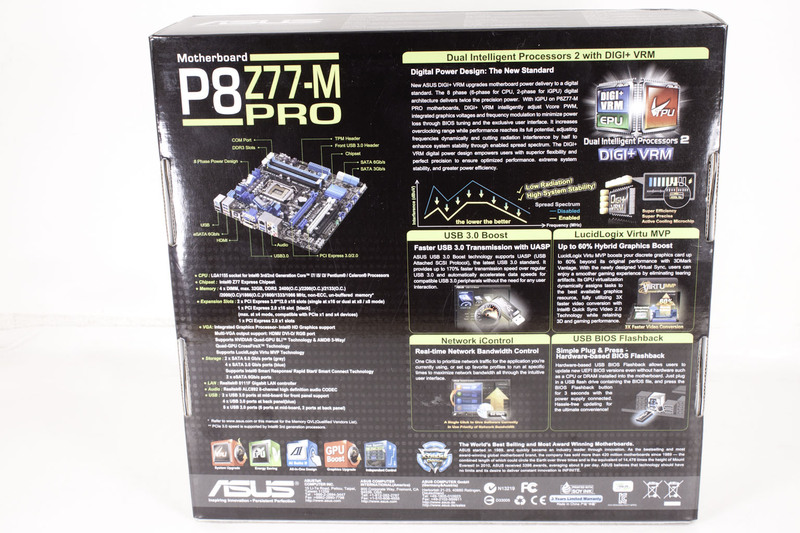 The box that the P8Z77-M Pro ships in is black with a dotted pattern on the board. If you look closely you will see that the pattern shows off an infinity symbol. Over that you have the name of the board and also a large logo for the Digi+ VRM system. 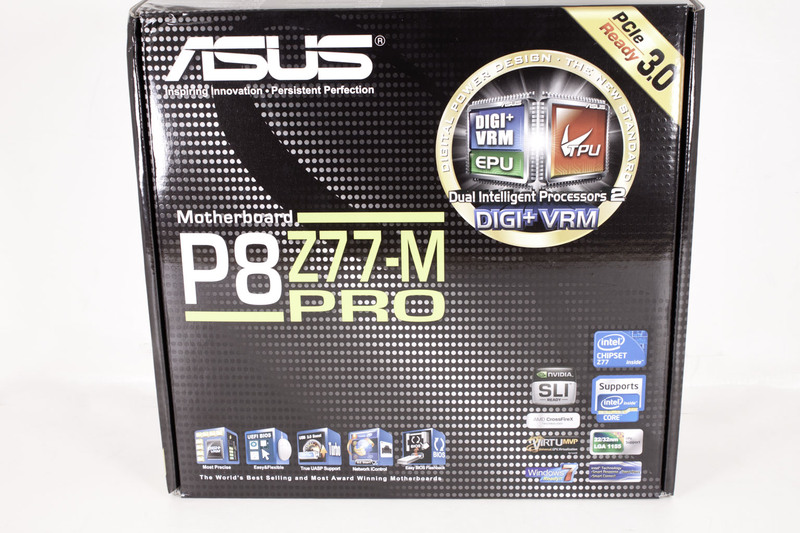 In the upper right hand corner is a banner that proclaims this board ready for PCIe Generation 3. Of course the main support for this PCIe specification will not happen until later when Intel’s 3rd Generation Core i7 CPUs hit. 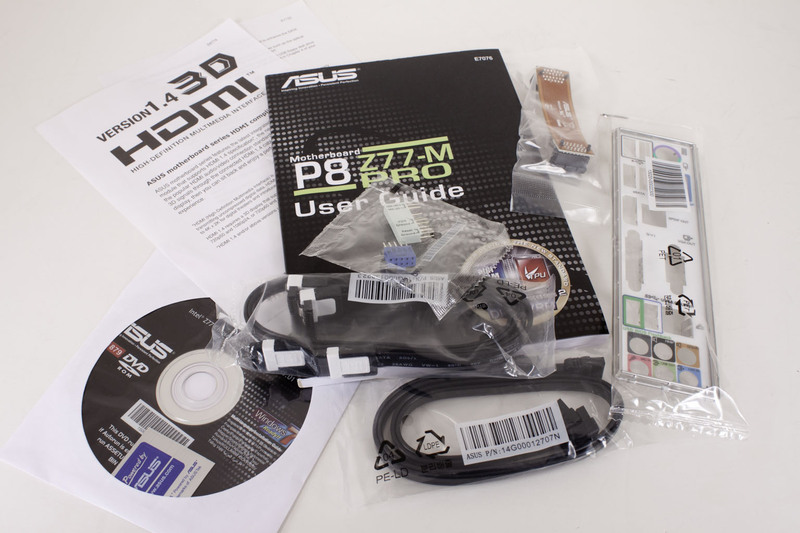 Other items on the box show off Asus’ new market specific feature set. You are getting items here that are meant to enhance this board in the market it is geared toward. The back of the box is something of an improvement. You get a diagram of the board along with some information on the feature set that Asus feels is the most interesting to the entry or channel level market. These are items like the Digi+ VRM, the USB 3.0 Boost, VirtuMVP, USB BIOS Flashback and of course iControl. Inside the box is a small amount of loot including an SLI/Crossfire bridge. There is also a piece of paper letting you know that the M Pro supports HDMI 1.4 and full HD (1080p) 3D displays. This will be a cool little bit of information for anyone looking to use this as an HTPC system.